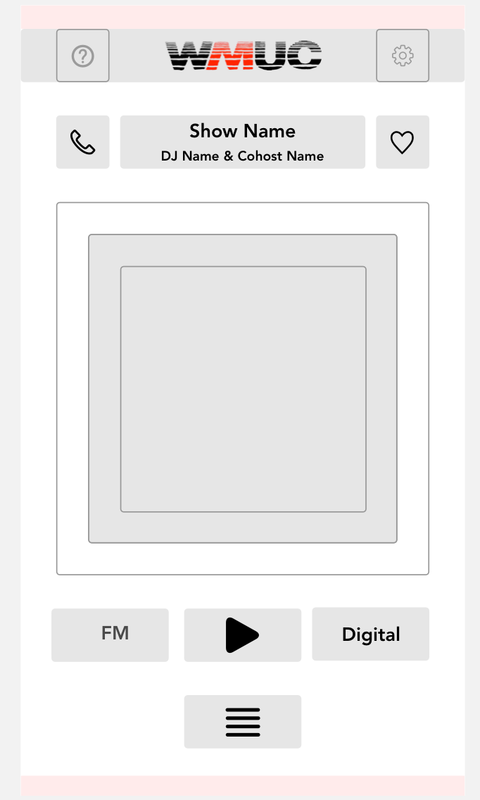 An app to connect the student-run campus radio station with the university community. In my freshman year, I was at a general body meeting for the radio station when a topic came up: most people listen to the radio station via the website, but the '.m3u' stream was not playable by iOS devices. As a result, most people could only listen when they were at their computer, and online. There were a few options to amend this, including redesigning the website to be mobile-friendly, or just changing the stream file type. After talking to members of the station, I found that there were other ways to listen in from your phone through radio apps like TuneIn. However, these other felt impersonal, and didn't match the freeform, DIY, grassroots aesthetic that the radio station embodied. A native app would give the station real estate on college students' most-used devices, and allow for future further interaction, like sending notifications. The app would focus on creating that kind of personal, for-students-by-students connection. However, the first step would be to bring the baseline functionality to people's phones, and see what the reaction was. At first, all it had to do was play the radio. That summer, I learned iOS development, sketched and scanned a user interface, and launched the first version to the iTunes App Store. The reaction was positive, and garnered a lot of feedback. I started to get another team member involved to develop an equivalent android app and keep the ball rolling. If this was going to be sustainable, the app would need a small team behind it to keep it up to date. This involved reaching out to the radio station community, and starting an official team with the radio station. Organization and logistics were key here, so we set up a regular meeting time, and got both projects up on Github. This is where I started to learn a lot more about organizing a team around a software product, tracking bugs, and maintaining a codebase. I also began to focus on designing a sleeker face for the radio station, while preserving it's individuality. The player itself would initially just be for the two live streams. Having stripped the app back to the basics with a team on board, we began to look to the future, and figure out what to build. We went to the community, and after many conversations with radio station DJs and current listeners, we developed a list of things to add to the app, then prioritized them based on value-add and level of effort required. And we began to sketch on how to organize the UI to be flexible enough to accommodate future updates. I then started drawing up further mockups for what the next version would look like, broke the new features up into segments to work on and test sequentially, and we got to work building. To promote the app this past fall, I lead a promotions effort, centered around fliers and QR-Code temporary tattoos. The goal of this promotions campaign was to increase downloads of the mobile app from students on campus. The temporary tattoos are a quirky way to wear an advertisement. It starts conversation, if anything, which is great for station awareness. QR codes were centric to the campaign as they link directly to the app, provide opportunity for analytics, and are scannable via Snapchat or other mobile apps. I used Onelink to mange the single-link campaign, and track results.